NEW YORK – Clete Boyer, the third baseman for the champion New York Yankees teams of the 1960s who made an art form of diving stops and throws from his knees, died Monday. He was 70. Boyer died in an Atlanta hospital from complications of a brain hemorrhage, son-in-law Todd Gladden said. “He wanted to be cremated and he wanted his ashes to go in a Yankee urn,” Gladden said. Boyer played from 1955-71 with the Yankees, Kansas City Athletics and Atlanta. He helped the Yankees reach the World Series in five straight years from 1960-64, when they won two titles. Boyer’s death came on the 50th anniversary of the day he joined the Yankees, completing a dozen-player trade between New York and the A’s. “He was a great Yankee and a tough guy. He never talked too much but he was extremely hardworking. A wonderful third baseman, and had fire in his belly,” Yankees owner George Steinbrenner said through a spokesman. In 1964, Boyer and his brother, Ken, became the first brothers to homer in the same World Series game. They did it in Game 7, and nodded to each other as they rounded the bases. The St. Louis Cardinals won the Series and Ken was the NL MVP that season. An All-Star third baseman, he died in 1982 at age 51. Another brother, Cloyd, pitched in the majors from 1949-55. There were 14 children in the Boyer family. Cletis Leroy Boyer was a career .242 hitter with 162 home runs and 654 RBIs. Decent stats, but it was fielding that became his signature. Boyer added an air of flamboyance to a Yankees team that otherwise played with a conservative precision. “In all my years of playing with him, he only made one bad throw to me,” former Yankees second baseman Bobby Richardson said by telephone from his home in South Carolina. Boyer’s lone Gold Glove came in 1969 in Atlanta; he might’ve earned more had it not been for the peerless Brooks Robinson. “He was in the Brooksie era. He didn’t get as much attention as Brooksie,” said Yankees manager Joe Torre, a former Boyer teammate with the Braves. After finishing with Atlanta, Boyer played in Japan. He later coached under Billy Martin with Oakland and the Yankees. Boyer was part of an exceptional Yankees infield in the 1960s that included Richardson, shortstop Tony Kubek and first basemen Moose Skowron. 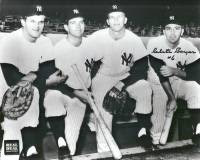 Richardson said he was with Boyer last month in New York for a reunion of the 1961 Yankees infield. “We had three or four, we looked forward to them,” Richardson said. The Yankees beat Cincinnati in the 1961 World Series. Boyer’s best Series performance came in 1962, when he hit .318 with a home run and four RBIs in the seven-game victory over San Francisco.